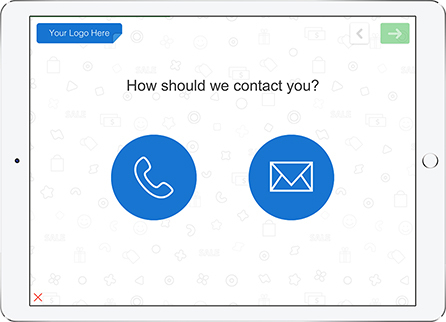 Analyze customer data, gain customer insight, and react quickly to feedback with this quick and easy template. Do you need a fast and easy way to measure customer satisfaction for your business? Collecting and using customer feedback is vital to any business. Customer feedback can help you make important decisions about your product and services, and keep your customers happy. Gathering customer satisfaction data helps you gather a clear picture of how your customer is using your product or service and will help you fix issues and decide what opportunities to pursue. Looking to capture data to measure your company’s customer satisfaction? 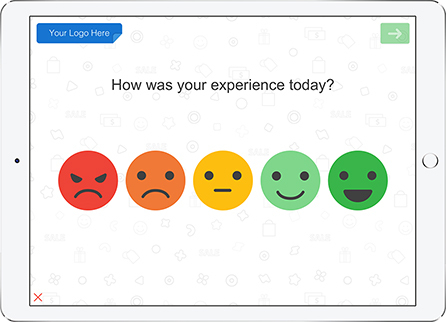 QuickTapSurvey can help you create beautiful, fun, and effective satisfaction surveys like this one. Throw away your pen and paper, and use this customer satisfaction survey template with zero technical skills required. 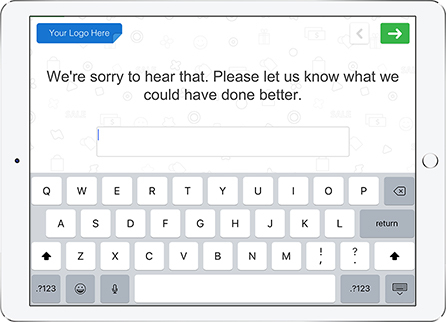 With our #1 app, you can collect feedback from your customers anywhere, even offline. Capture customer feedback in person or gather data remotely using a customer satisfaction kiosk. You can build your CSAT survey template and start collecting responses on your mobile device or tablet in minutes. 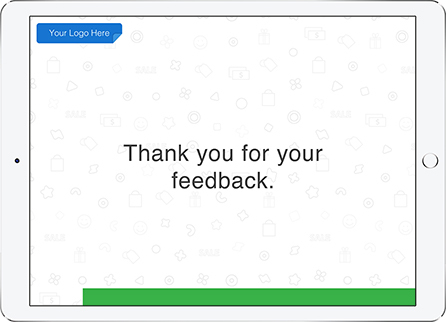 With over 35 amazing question types to choose from and great features like question branching, automated email responses, satisfaction questions, sliders, and star ratings, you'll be able to build and brand your own beautiful feedback surveys easily and quickly. Once you start collecting responses, you'll be able to view your customer data in real time and generate beautiful and shareable reports for your team to review and take action on. This customer satisfaction survey template can be fully customized with your own logo, background image, font colors, and button colors. You can also select from a range of fonts to better match your company’s visual style. With QuickTapSurvey’s question branching feature, you’ll be able to change what question a customer sees next based on how they answer the current question. For example, if a customer responds in this CSAT survey template that they had a negative experience, they will be asked if a member of their team can follow up for further information. QuickTapSurvey’s innovative survey app lets you collect responses from customers without an internet connection and sync your responses once you’re connected to Wi-Fi. No need to worry about data loss! 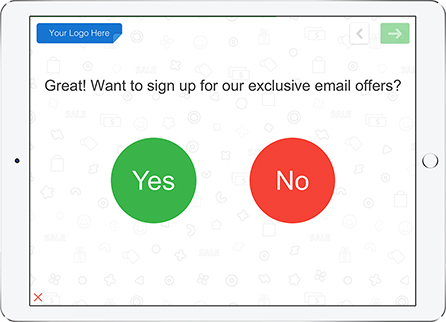 Create a new survey and choose the Customer Satisfaction template from our template library. Customize the survey to your needs, and publish it when you’re ready to start collecting data. 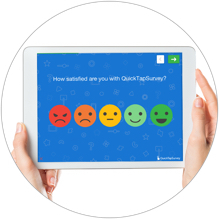 Download the QuickTapSurvey app on your tablet. 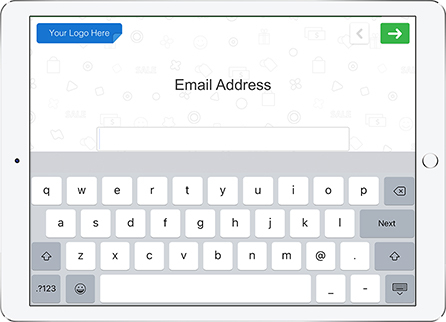 Login and sync the survey you have created to your device. Now you’re ready to start collecting data. You don’t even need an internet connection - the responses will be saved and synced to your account once you are reconnected to wifi. Collect feedback in person from your customers, or place your tablet into a kiosk for unattended response collection. 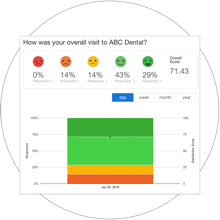 View and download your data in multiple easy to use formats, and generate visual and shareable reports using our powerful analytics and reporting dashboard tools. Utilize our powerful reporting and analytics tools to understand and take action with your data. 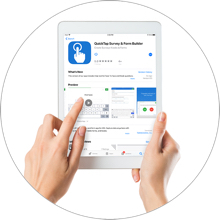 With the QuickTapSurvey app you can effortlessly gain insights into your data by using our advanced reporting and analytics tools. 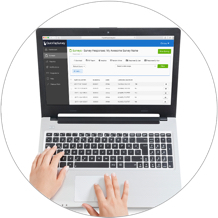 Through our analytics dashboard you can view your collected data and download it in multiple formats. 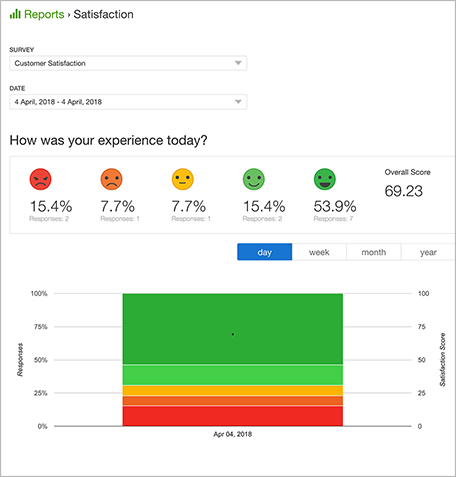 You can also generate a variety of useful reports, including an Analytics report, an Active Kiosk report, NPS reports, and Satisfaction reports. These reports will help you monitor results in real time and share your data in professional and graphical formats.